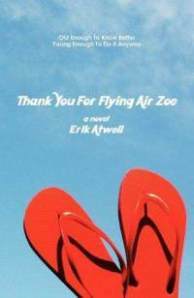 After reviewing Thank You For Flying Air Zoe, yesterday, I am pleased to welcome the author, Erik Atwell, to the blog today. Erik, thanks for stopping by on your blog tour. Change the Word: How did you come up with Thank You For Flying Air Zoe? Erik Atwell: First of all, Laura, I’d like to thank you for flying Air Zoe, as well as having me here for this Q&A. I had no story when I said this. Not even close. I just thought it was a really cool title, and I was likely going through a similar existential crisis at the time. The plot lines and such came later when I finally decided that this Zoe character I pulled out of thin air was a former teen rocker girl turned bored butter saleswoman. And that was pretty much the novel’s point of liftoff. CTW: I love it. I often come up with stories based on a title that comes to me. The story centers around a character who was in a band that almost made it big. Were you ever in a band yourself? EA: Haha… Funny you ask, because I recently wrote a column addressing this, which will be popping up at another Blog Tour hotspot in the near future. But the long and short of it is yes, I was most definitely in a band. Which is to say, I was one-third of a group of childhood friends that decided to have a little fun at a local pub’s Open Mike Night many years ago. We played three songs, on occasion sounded like we were almost in tune, then quickly hung up our instruments and decided we should cling for dear life to our day jobs. CTW: I'm jealous. I've always wanted to be in an 80s cover band, myself. Do you sing or play a musical instrument? If so, describe. EA: Yes and no on the singing. I will routinely sing pretty much anywhere, but as with our “band’s” time on stage, I wouldn’t say I’m destined for The Rock And Roll Hall Of Fame. I have a few go-to karaoke songs that allow me to trick an audience into believing I can sing well, but for the most part, I should probably be kept away from the microphone. As for musical instruments... Another yes and no. I can make a piano sound sort of nice, and can often play songs by ear. But I have always struggled when trying to learn how to read music and have the notes on the page correspond with my fingers. I get all crisscrossed and end up sounding like I’ve suddenly put on a pair of mittens while in the middle of playing. CTW: What kind of character development do you do before writing? EA: I’ve learned over time to not get too bogged down when it comes to any developmental stages of writing. And unfortunately, I learned this through many trials and just as many errors. Long ago, when I was studying screenwriting in grad school, I actually wrote a protagonist’s entire journal as part of their character development. I think this silly exercise may have taken me longer to write than the screenplay itself ultimately did. Basically, I will jot down a few facts, qualities and quirks for the primary and secondary characters, then let them find their voice as I write the story. CTW: Do you plot out your story before beginning or write what comes to you? Why? Of course, I’m not at all familiar with E.L. Doctorow’s work, but I think he’s ridiculously brilliant to have so concisely nailed this one. CTW: I like that quote. What was the writing process like for Thank You For Flying Air Zoe? EA: It was really great... ‘Til one of my headlights blew out. Just kidding. But to continue with Doctorow’s analogy, it was certainly a lot like the proverbial dark drive in the fog. Sometimes the road was smooth, and I found the writing effortless enough to be at one with any sharp curves in my path. Other times the road was so rough, rutted and cluttered that I had to just stop what I was doing for fear of totaling the whole damn car. Almost always, it takes me 75 percent of my collective writing time to write the first 25 percent of the story. I struggle to find the right flow through the first few chapters, but then at some point about 50 pages into the story, everything makes sense, and the story becomes a joy to write. It’s that point in the story when I’m no longer writing because I feel like I have to, but rather because much like a reader, I’m just bursting to find out what happens next. CTW: Your book has a lot of natural humor in it. How do you incorporate humor without making the laughs seem forced? EA: Thank you — very kind of you to say that. It’s always great to hear this from readers, because truth be told, often we writers are too close to the words to really know whether or not they sound forced. I think the trick is to not actively look for the humor. For me, the litmus test is simple. Read what you’ve written out loud. If it sounds clunky, it will probably fall flat. But if it makes you smile, then you’ve probably hit the comedic target. CTW: When did you realize you wanted to write books? EA: Well, I’ve wanted to be a writer since high school, when a pointed essay taking shots at my school’s administrative policies put me on their silly little watch list. It was then that I discovered that when properly motivated, I can be pretty ferocious with a pen and paper. So I did. I wrote a screenplay about a woman who believes she was Emily Bronte in a past life. It was very poetic and art house. So I did. And of course, this too was kind of art house. That was the second time I realized that I wanted to write books. There won’t be a third time. I’m pretty cool where things are these days. CTW: You have a new baby. How do you balance the life or a writer with being a parent? EA: You know, I really don’t. Prior to parenthood, writing was something I’d been able to do at any time of any day. Writers often like to say that they write when the muse inspires them, and I guess I was able to work under a similar structure. I wrote when inspired, and I had time on my hands to do so. Lots and lots of time. And time is without question one of a writer’s greatest tools. SIDEBAR: 35 minutes have elapsed since I wrote the words, “These days.” Right now, our little one is either going through a teething battle, a growth spurt, or by the sounds of his poor, anguished cries from the crib, probably both at once. And just over 35 minutes ago, here at 9 p.m., he launched himself into an enormous fuss that sent us scurrying for food, teething toys, our own sanity, and anything else that might help him get back to sleep. Eventually, of course, he calmed down and got back to sleep, but for how long will he stay down? I guess at least long enough to write these last few lines, right? And herein lies the delicate new balance. It’s really not about trying to achieve a perfect balance these days, because the little man is in charge of my schedule, and he routinely doesn’t give me notice with respect to what he wants from me and when. I might get two minutes to write between his needs, or I might get two hours. But usually, it’s closer to two minutes. At the moment, it’s impossible for me to get into a writing groove in the way I once did. But ever so slowly, I’m learning how to take a few minutes here, sneak in a few minutes there. And once the boy grows up a bit and allows me more time to write, I’m totally going to get revenge by writing all about him! Lucky for him he’s a pretty awesome kid. CTW: What advice do you have for new writers who are struggling to find their voice? EA: I would tell them to step away from the computer monitor, take a deep breath, then allow ample time for their voice to find them. Oh wow, that sounded a little bit too Zen, didn’t it? I think what I’m trying to say is that much like humor itself, a writer’s authentic voice cannot be forced into action. It’s already there inside the creative brain, it just needs to test-drive a few storylines and narrative styles for it to flourish. A writer’s voice -- at least from where I sit, two-plus decades into a still relatively new career — is always a work in progress. Whatever your voice is today, I can almost promise you that it will be different two years from now. You will have learned new techniques and tricks that will help this voice resonate more than ever before. And two years later, you will probably see another spike in the evolution of your authorial voice. What’s most important is that you just keep writing, because there will be a moment when you look at what you’ve just written, and you know what you’ll say? Thanks for hosting me, Laura — it’s been a pleasure! 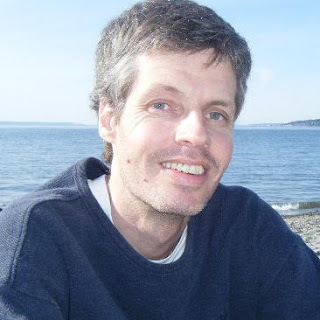 About the author Erik Atwell started his writing career in grammar school, when a one page history class assignment ballooned into a forty page fictional account of a politically controversial silversmith in Boston circa 1776. From there, he wrote short stories while living in New Hampshire, screenplays upon moving to Los Angeles, then finally novels when he ultimately landed in Seattle. He now lives in Seattle with his rock star wife and his six-month-old son, whose only musical claim to fame thus far is sleeping through an entire Go-Go's concert. But in his defense, he was three weeks old, and the stage was a quarter-mile away. Thank You For Flying Air Zoe is his first novel, and he hopes to write a second novel before the little guy treks off to college. And many thanks to you, too, Laura! I can't wait to read your book - it's making its way to the top of my TBR pile!